Born in the Bekaa village of al-Nabi Eila, former head of General Security Jamil as-Sayyed has a long political history that has garnered much media attention. This has been especially true in the past five years, as he was imprisoned on suspicion of involvement in the 2005 assassination of former Prime Minister Rafik Hariri and then later released due to lack of evidence. 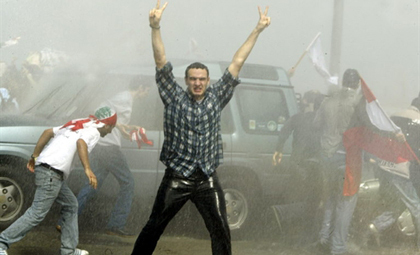 Just last week, on September 18, the spotlight was once again drawn to Sayyed when he was escorted out of the Beirut International Airport by Hezbollah security officers following his return from France. The Hezbollah security entourage was present because a summons had been issued for Sayyed to appear in court following a statement he made on September 12 attacking Prime Minister Saad Hariri. But Sayyed is not Hezbollah’s only high-profile ally. Free Patriotic Movement leader Michel Aoun is also partnered with the Party of God, making the former head of General Security and the FPM leader indirect allies. 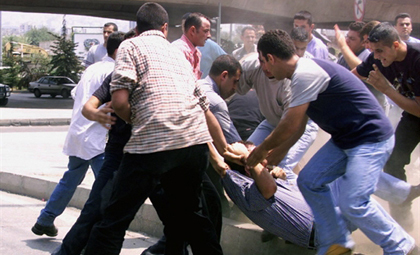 Sayyed’s past, however, is littered with incidents showing his opposition to Aoun, including instances in which police and intelligence agents oppressed Aoun supporters who were demonstrating against the Syrian presence in Lebanon. 1976: Jamil as-Sayyed joined the First Brigade of the Lebanese army in the Bekaa Valley. Prior to this he was stationed in Beirut, where he served with the armed corps. The First Brigade was under the control of Brigadier General Ibrahim Shaheen, who, under Syrian supervision, established the Arab Lebanese Army. At this time, Sayyed began to form links with the Syrian government. 1977: Sayyed took control of the First Brigade’s intelligence branch. 1984: Colonel Michel Rahbani was transferred to Beirut, and Sayyed was appointed chief intelligence officer in the Bekaa Valley. 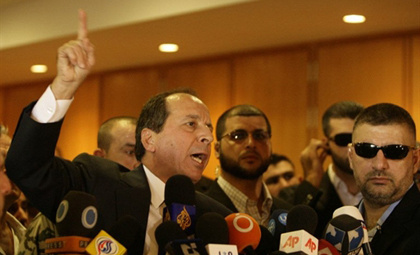 1989-1990: Sayyed headed security for former Lebanese President Elias Hrawi. 1992: He was appointed deputy chief of military intelligence. 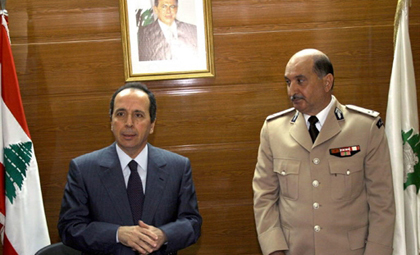 1998: Then-President Emile Lahoud appointed Sayyed as the head of General Security. The two worked closely together. 1999-2001: Lebanese journalist Samir Kassir, who frequently spoke out against the Syrian presence in Lebanon, was under surveillance by General Security. 2000: Sayyed was assigned with the task of cross-examining potential candidates for the soon-to-be-formed parliament and cabinet. On September 18, he spoke to the press upon arrival at the Beirut International Airport. His earlier attack on Hariri prompted many responses, and led Lebanon’s top prosecutor, Judge Said Mirza, to summon Sayyed for questioning. 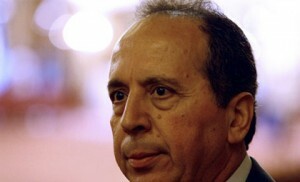 Hezbollah, however, called on the judiciary to revoke Mirza’s decision, calling it politicized. Yes I would like Aoun Supporters to see this picture who still support their clown leader who sent delegation to meet this Saadan at the airport. Those also they call themselves the resistance and as pure lebanese, this monkey is nothing but a Syrian puppet. Anyone who protect and support him is a traitor to lebanon and a criminal. This criminal has tortured and killed many lebanese. 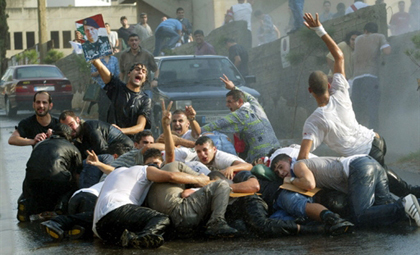 those who are truly fighting for Lebanon dignity and sovreignty would not lend a hand to this monster. But that’s what they call themselves the resistance to israeli occupation but not syrians.. How can be one occupation be different from the other.. Oh wait Syria is brazzerly nation and we suppose to embrace it. The resistance will be non-existant by mid-next year…And Jamil Al Saadan will be hanged in Beirut along with Lahoud and Aoun and Nassrallah. And Qassem too..
Why am I not surprised? Why am I never surprised? Wow impressive resume…he basically has made himself a career from protecting Syria’s interests in Lebanon, I must admit he has done an excellent job doing what he does for such a longtime. Can you blame Sayyed for the above? If yes then you basically have to blame the entire Leb Goverments that has been formed since 1973 till 2005 for doing the same job Sayyed did for Syria. Not so long time ago we used to wait for the Green Light from Syria to choose our Prime Minister and President.